It may sound like a fictional middle-European kingdom, but as you probably know Fitzrovia is an area of London. Taking its name from the old Fitzroy Tavern on Charlotte Street, it became popular with artists and writers, who turned it into something of a creative centre in the 1920s. The name Fitzrovia became widely used between the wars but wasn’t officially recognised until 1994, when it appeared on Ordnance Survey maps for the first time. So how can estate agents in Fitzrovia help you find your perfect property? The area of Fitzrovia is split between two London boroughs – the City of Westminster and Camden and therefore takes in a big part of London’s commercial centre, bounded as it is by Euston Road, Oxford Street, Gower Street and Great Portland Street. It also includes the iconic BT Tower. This means that it’s a thriving business district with in excess of 50,000 people working there. However, don’t write it off as purely about commerce – it has more than 6,000 residents with new developments springing up all the time. The area offers a unique blend of old and new, spanning from elegant Georgian town houses, to period mansion blocks and ultra-modern apartments and our Estate Agents in Fitzrovia have the knowledge and experience to help you find that perfect property. Fitzrovia is an attractive residential area, and being part of the West End which is the largest central business district in the UK, it is popular with many businesses looking for a convenient and prestigious central London location, and their employees who are looking for an easy commute! Whether you’re looking for a residential property, somewhere to site your business or a property investment, our estate agents in Fitzrovia will be able to advise you on the available options. As ARLA registered Estate Agents in W1, earlier this year Davis Brown attended the London ARLA Regional meeting earlier this year to find out some more information about the changes to the Consumer Rights Bill. The new ruling declared that all agents must display all fees associated with renting a property. The idea is to eliminate any confusion about the costs involved with letting and renting and avoid any hidden charges springing up. Davis Brown are estate agents and chartered surveyors based in London, it is vitally important for us to comply with all legislation and make sure that we are providing the best service to clients and applicants alike. To make things a little easier for you, we have drawn up an overview of the new rules and what it means for you as the consumer. All estate agents must display a list of fees at all of their premises where the agent is dealing face-to-face with consumers – for example at our office in Fitzrovia; our fees are displayed in reception to ensure they are easily accessible. Agent’s fees must also be displayed on the company’s website – as estate agents in W1, our website has a downloadable PDF version so that it can be saved and kept for reference. The list of fees must include all possible charges with a clear definition for each. For example, vague terms such as administration cost cannot be used and must be explained. As estate agents in Fitzrovia, we believe our administration costs are fair as they cover the administration associated with the tenancy such as undertaking references and preparing the agreement. All costs must now also be inclusive of VAT to further avoid any ambiguity over the costings involved. Furthermore, it must be clear whether the fee is charged per tenancy, or per tenant. Sometimes a fee cannot be reasonably determined in advance, for example inventory charges are based on the size of the property and whether it is furnished or not. In cases such as these, the list of fees should explain how a final cost will be calculated. The aim of the legislation is to make it clear to both landlords and tenants what costs are involved in renting / letting out a property. The hope is that agents will be up-front with their fees and charges, which will make it easier for you, the consumer to make an informed decision about the agency you choose to use. For more information about renting or letting a property in W1, contact our estate agent’s Emma or Sarah-Jane. London is a thriving city and therefore an attractive location for businesses of many types and sizes. Whether your operation is already located in London or you’re looking to relocate it here, commercial agents in London will form a vital part of your search. You might be wondering why you’d want to have your business in London in the first place. The fact is that as well as being the capital, it’s also at the heart of the UK’s business and financial world. This means easy access to a range of services and other businesses in the same or similar sectors. Strong transport links to the rest of the UK and Europe mean that London is easily accessible. Add in the features of the city itself and its potential for entertaining and impressing clients, and you can see why so many companies choose to have either their main location or at least a presence in the London area. A firm of good commercial agents in London will know the city well and be able to advise on the best locations to suit your particular needs. Once you’ve decided on London as a location, you need to think about whether to buy or rent a property. Partly, this will depend on the nature of your business and your plans for the future. If your company is expanding fast, you may not want to tie yourself into buying a property that you’ll quickly outgrow. In these circumstances, finding a commercial property to let is an attractive option, as it’s easier to move on when you need more space. On the other hand, if you’re looking for a degree of permanence, then buying a commercial property may be the right option and in the long run could prove to be more cost-effective. There is, of course, also the potential for investment buys, allowing you to take advantage of the busy London rental market. Even if you’re looking for accommodation for your own business, you may choose to buy a property that’s larger than you need and earn extra income by renting out the surplus space. Experienced commercial agents in London will be able to advise you on the likely earnings potential of any such arrangement. Davis Brown has many years of experience handling commercial property in London, and our experienced staff are always happy to discuss the requirements of your business. 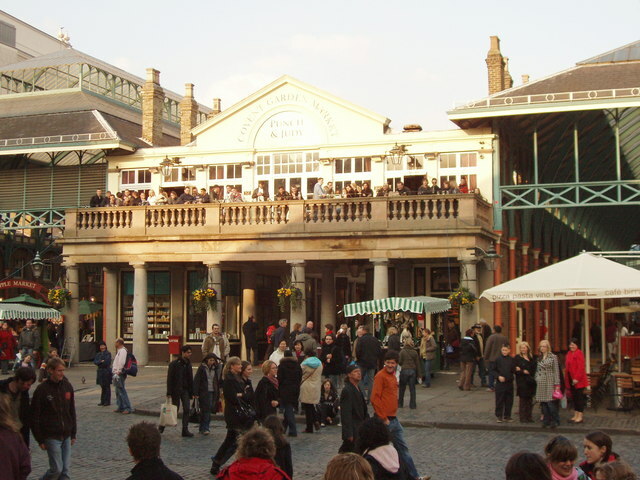 Covent Garden is an iconic area of London, with its vast array of restaurants, shops, hotels and of course theatre. However as all London estate agents know, Covent Garden also has a superb and diverse mix of residential property to offer. Just South of Soho, Covent Garden is located in central London, bordered by the City of London and Leicester Square. As estate agents in Covent Garden can tell you, the name Covent Garden does in fact derive from ‘convent garden’. The area provided much of London’s supply of fruit and veg in the 13th century, and it belonged to the Convent of St Peter at Westminster. When Henry the Eighth decided to go through with the dissolution of the monasteries throughout England around 1540, the land was given to the first Earl of Bedford. In 1627 the famous architect Inigo Jones was commissioned to build grand houses around the Piazza, which were highly sought after by distinguished gentlemen of the era. As well as these buildings which still stand today, the original cobbles can still be seen on certain streets such as Floral Street. Estate agents in Covent Garden can tell you more about the history of the various buildings which have now been converted to residential use. The best way to get around Covent Garden is to walk – small quiet streets just off the Piazza make for easy short cuts away from the hustle and bustle. As estate agents in Fitzrovia, we travel on foot to Covent Garden, it’s the easiest way as only residents and locals know their way through the winding streets. Transport links are also extensive with immediate access to five different tube lines from Covent Garden, Charing Cross or Embankment, as well as regional and national rail connections from Charing Cross, Waterloo and City Thameslink. The area is particularly convenient for those who work in the City or in the legal profession based around Holborn, as it is easily within walking distance of both districts. Covent Garden is renowned for its theatres and musical venues, including St Martin’s Theatre, which still shows the world’s longest-running production, The Mousetrap. There is also the stunning Royal Opera House, which has been entertaining people for over 200 years, and is also home to the Royal Ballet Company. Somerset House, a hub of creativity and art is a short walk away and hosts a huge number of events and workshops – in the summer months look out for concerts and over Christmas book in to the famous ice rink. Spend some time window shopping – whilst Covent Garden is home to some big brands, if you leave the main streets you’ll find a vast selection of unique and independent boutiques such as Christys’ Hat Shop which has been open since 1773. Newly refurbished, The Ivy is iconic and for those of you wanting to splash out, it’s a must. For a quicker bit to eat, drop in to Pix where food is served buffet style for you to pick and choose at your own pace. For a romantic evening, Clos Maggiore is the perfect place to spend the night sampling exquisite French cuisine. Dirty Martini is the place to be after dark – cocktail lovers can while away an evening sampling a host of different drinks created by the expert mixologists. Alternatively try the Corinthia Hotel to meet up with friends in the luxury of this beautiful building. 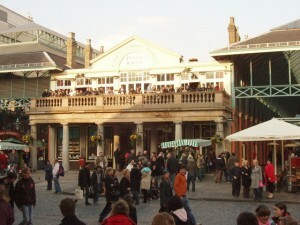 Covent Garden has a diverse mix of residential property to offer residents. As all estate agents in Covent Garden will know, buildings range from modern ex-housing association flats with quirky gardens such as Stedham Chambers, to luxurious apartments on the highly desirable Floral Street where buildings date back to the 1600s. With such a variety and expansive property portfolio, Covent Garden accommodates families and young professionals alike. Schools on offer include the St Clement Danes Primary School on Drury Lane and The Royal Ballet School on Floral Street. Professionals benefit from the huge number of businesses within easy commuting distance, and the array of restaurants to take clients and colleagues. For more information about properties in Covent Garden, please contact Emma or Sarah-Jane at Davis Brown Estate Agents on 0207 637 1066.